The World's Worst Records: Dear God! As both a longtime XTC and TR fan (and I have most of his albums, solo, w/Utopia, and productions), I'll agree that this isn't one of his best. Todd, however, also deserves more credit than he's given for his talent and career here. While many "classic rock" artists turn to regurgitation, TR pushes himself - not always successfully (as evidenced by Re-Productions), but sometimes admirably (The Individualist, Liars). I can see why he'd pick Dear God for his Re-make, since he's also come out against religious hypocrisy (Fascist Christ, Cast the First Stone, Mammon, to name a few). One thing to clarify - I've read that TR was Dave Gregory's suggestion, because he was a fan. I'm sure the ever-annoying labels also put pressure on them, too. Yes, your right. Virgin presented Andy and the boys with a list of producers, most of which they'd never heard of. Todd's name jumped off the list, and Dave - being a fan - thought he would be a great to work with. Speaking of Todd Rundgren, his former bandmate from the 1960's groups Woody's Truckstop and Nazz, Carson Van Osten, has just passed away in December 2015 at age 70. Any thoughts on this, Daryl? I know the music world has been spending the past half-week mourning the death of David Bowie, but Van Osten's passing made little news mentioning. As for this record, it's just "meh" to me. Todd has done better work elsewhere. "Dear God" is right . . . what a monstrosity! What WAS he thinking? Thanks for the song! XTC fan? I knew there was something I liked about you, besides the sense of humor it must take to listen to all these records. I quite like it actually. Not nearly as good as the original, granted, but the strength of this song carries this new version well enough. I've always been on the fence with Dear God. My wife hates it. I can do without that kid singing, but the video is cool with those people in the tree. I had the first pressing of Skylarking without it, but sadly that copy vanished. Now when I play the cd I program around it. The track did push me over the edge towards atheism if that counts for anything. 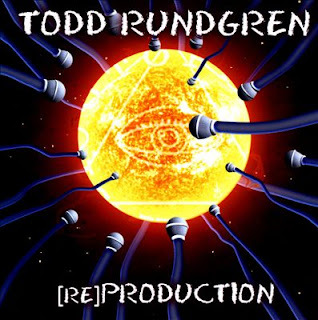 And for Todd Rundgren, he did produce one great album for The Tubes - Remote Control which is one of my all time faves.